Alford celebrated their first win of the season and a move off the bottom of the Readers Lincolnshire ECB Premier League table, beating Lindum by five wickets after Rikki Bovey had recorded the day’s best bowling figures of six wickets for 10 runs. 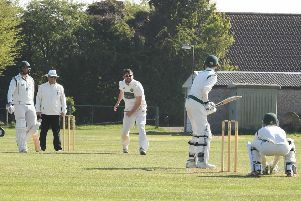 Bracebridge Heath stay top, the only unbeaten team in the league, after a 59 run win over Woodhall Spa in a game that brought three half centures, as did the day’s top scoring match between Grantham and Louth. Joe Price hit 80 as the leaders finished on 265 for nine and Woodhall Spa’s run chase was going well, Harsha Vithana (61) and Prasanna Jayawardene sharing a third wicket stand of 97 to take the total to 168. Jayawardene took Woodhall to 201 for five but when the Sri Lankan was out for 57, Alex Willerton and Andy Carter cleaned up the final four wickets for only five runs. Oliver Hickford made 51 for Grantham and Dan Freeman regained his batting form to hit 74 and help his side to 251 for nine at the close. Louth’s batsmen were also on good form with Xander Pitchers making 80 to take his side to 200 and from 212 for seven, Jason Collinson and Tom Cuthbert batted the overs out and took the final total to 236 for seven. Sleaford notched up a similar score against Scunthorpe Town as Matthew Mountain and Andy Hibberd shared a second wicket partnership of 165. Both were out in quick succession, for 68 and 84 respectively, but a quickfire 29 from Oliver Burford helped the final total to 253 before the last wicket fell in the 50th over. Scunthorpe’s top order batted steadily, taking the score to 150 for four but a fine spell of bowling from Adi Sreedharan saw him take three for 17 off seven overs to help bowl the visitors out for 177. This leaves Scunthorpe in fifth place in the table with Grimsby Town dropping from second to fourth after losing a low scoring game at Bourne by seven wickets. Grimsby were bowled out for 130 and despite taking two early wickets, Bourne ran out easy winners. Alford bowled Lindum out for 122 and also went on to win by three wickets, Andrew White hitting an unbeaten 59, but the surprise result was at Boston where the home side were bowled out by Market Deeping for a meagre 112, Sachita Perera claiming five for 27 off 10 overs. Deeping then lost their first three wickets for seven runs but Josh Smith and James Hook got the innings back on track, taking the total to 42 and Smith and Perera helped the score to 72 for five. But from here, Deeping collapsed to 76 for eight and despite the efforts of Smith, who was last man out for 64, the final wicket fell on 97, taking Boston up to sixth place in the table. Results: Bracebridge Heath 265-9 (Price 80), Woodhall Spa 206 (Vithana 61, Jayawardene 57); Grantham 251-9 (Hickford 51, Freeman 74), Louth 236-7 (Pitchers 80); Sleaford 253 (Mountain 68, Hibberd 84), Scunthorpe Town 177; Grimsby Town 130, Bourne 131-3; Lindum 122 (Bovey 6-10), Alford 123-3 (A. White 59no); Boston 112 (Perera 5-27), Market Deeping 97 (Smith 64).